God, Charlton and Punk Rock: Up Pompey! Modern football never sleeps. Charlton Athletic have a full ninety minutes left to play this season, yet before the dust is being given a chance to settle, this summers pre-season friendlies have been announced by the club. Handy if you haven't actually booked your holidays yet. 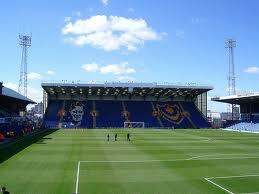 The cream of the crop has to be a trip to Fratton Park and Fourth Division Portsmouth. Always a great ground to visit, there are plenty of superb watering holes in the town. Portsmouth of course are now the largest fan based owned football club in England, and like the many others in that situation they have my deepest respect and good wishes. Pompey know more than anyone with their 'island' like mentality how mismanagement can ruin and destroy the history, pride, and livelihoods of not only the club and it's loyal supporters but the townsfolk as a whole. There must be a theme to these friendlies as AFC Wimbledon, a club also owned by a supporters trust, will welcome the Addicks to the Kingsmeadow ground in Kingston as well. The Dons survived by the skin of their teeth in an enthralling League Two relegation scrap last weekend to achieve a third successive season at that level. No mean feat when you consider how small their budget is in comparison to their counterparts. Another side caught up in the mire at the foot of the league with Wimbledon were Dagenham & Redbridge. They too will play host to Charlton as the Addicks continue their tour of local League Two grounds. Welling United will, as is traditional, start our pre-season outings. The Wings will be looking forward to a season at the highest level of non league football after claiming the Conference South title this season, while Isthmian League Thurrock will entertain a 'Charlton XI' (probably the newly crowned Kent Senior Cup winners team) in the one other friendly announced, although expect one or two more to be confirmed during the summer. I highly doubt however that this will include a trip to Spain again. We mustn't forget though as we hastily scribble these dates in our diaries the small matter of finishing this campaign first. The club certainly don't want you run the risk of losing interest for a couple of months do they!